With the crew in my family, dining at Disney World is not just any old eating experience - It's an event! We take it seriously. It's not just about the food. It's about the atmosphere. It's about the interactions with cast members. It's about memories being made. Like Cinderella (but in a good way! ), we anxiously watch the clock waiting for it to strike midnight at the 180 day mark so we can begin making our Advanced Dining Reservations or ADR's. We scour the menus, argue back and forth, and finally narrow down our choices. Disney World has so much to offer. The variety of dining options can be challenging when it comes to deciding where you want to use those Dining Plan credits or spend those hard earned dollars. Everyone in my family has their own individual favorite but one is always, always, always a must: No Disney World vacation is complete without breakfast at Tusker House at Disney's Animal Kingdom. Tusker House is a character, buffet-style restaurant located in the Africa section of Disney's Animal Kingdom Park. The restaurant serves breakfast, lunch, and dinner - all buffet-style. It can be easily overlooked while passing through because it is a somewhat non-descript building that blends in well with the overall African village landscape. A small sign gives it away. The theme of the restaurant is of an authentic village market. When you enter the buffet area you will notice the food stations resemble market stalls laid out in an open, airy space. The decor is rugged with the appearance of being weathered. Intricate carvings, fabrics, and informative and sometimes humorous signs hang throughout the establishment. I particularly like the ones with African names for animals. It's a lot of fun trying to say those with a southern accent. The cast members that serve as wait staff get a kick out of my attempts, I think! The wait staff are fantastic, and most are from one of Africa's many countries. They love to engage in conversation, and are a fountain of information about their native countries. They always go out of their way to make dining at Tusker House special. I find the overall atmosphere to be simultaneously laid back and upbeat. I'm not a morning person, but Tusker House has the amazing effect of making the early morning grumps just melt away! I always recommend Tusker House when family and friends come to me for help with planning a visit to the "happiest place on Earth". I always tell them, "you have to eat breakfast at Tusker House!!" They all always ask the same thing: why? I thought about that, and the reasons are many. I have, for the sake of time, narrowed it down to my five main reasons to eat breakfast at Tusker House. I am a grown woman, but I admit I love the characters that call Disney World home. 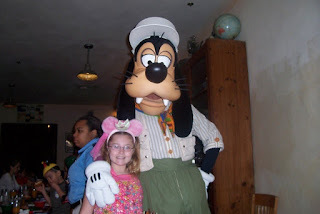 Breakfast at Tusker House is a great way to meet some of my favorite classic Disney characters. While munching on the fantastic fare, characters arrive to help start the day in true Disney fashion. Donald Duck, Daisy Duck, Mickey Mouse, Minnie Mouse, and my personal favorite, Goofy, all make their rounds, and the excitement skyrockets! They are all dressed in khakis and field hats strolling happily from table to table. Each character takes time for autographs and photos. Minnie even throws a few kisses. Goofy's antics always bring smiles and laughter around our table. Even though my children are no longer preschoolers, I still love watching them interact with our Disney friends. It also does my heart good to watch the families that do have young children enjoy this moment. It is Disney magic at its best. 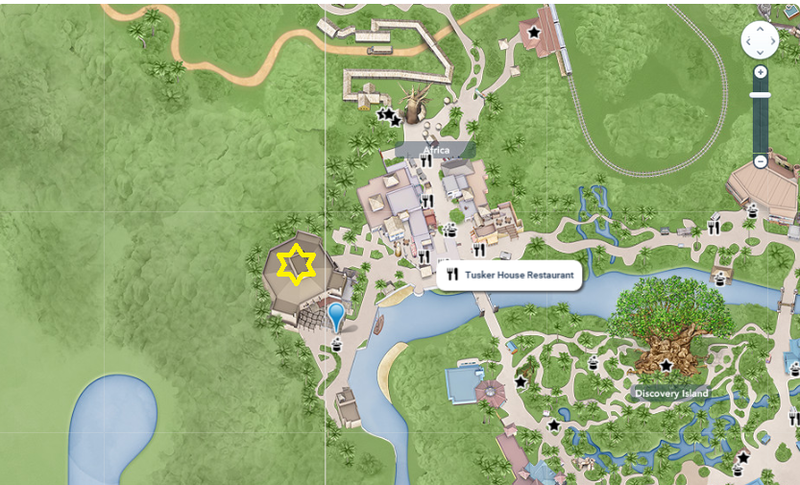 Making reservations at Tusker House as early as possible is some the best advice (in my humble opinion) that I can give anyone planning to eat breakfast there. For a non-morning person like myself, the idea of rolling out of bed at the crack of dawn (on vacation, no less!!) just to eat breakfast may seem a little daunting. But trust me - it is worth the bleary-eyed stumble that morning. Arriving early can require a little extra planning as far as transportation goes. Resort buses typically begin running early enough to get to an 8:00 AM reservation. Unfortunately, they run less frequently at the start of the morning so you may want to be at the bus stop extra early to ensure you do not miss it. Upon arriving you will be allowed into the park once your reservation has been verified by the cast member at the front entrance. That is when something magical occurs. Animal Kingdom is yours!!! I highly suggest that you arrive at the park early enough to be able to take a leisurely stroll down the walkways to your destination. 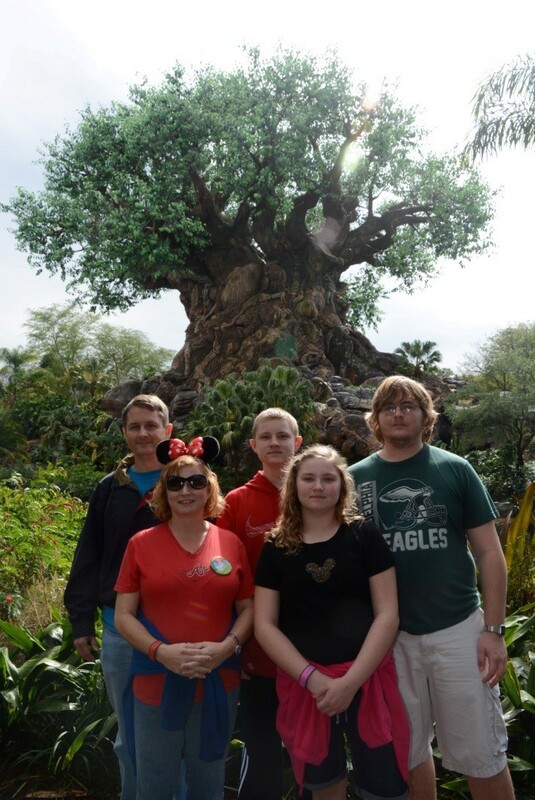 Take a picture in front of the Tree of Life without crowds roaming into your shot. Since Tusker House is located at the far end of the park in the African section, take your time and enjoy the walk. Look out for the birds and other creatures that are waking up to start the day. (Look but don't touch!) Their calls and songs add to the almost surreal atmosphere. Admire all the flora and fauna that bring their natural beauty to the park. Take in all the little details and special touches that only Disney adds to bring their parks to life. The architecture and native artwork are amazing and often overlooked in the hustle and bustle of the crowds. Take a moment to smile and greet the cast members you meet along the way. There is something magical and serene about being in the park before opening. Immerse yourself in the feeling and enjoy! Being at the park early has a magical atmosphere but it also has a very important perk. Tusker House is in the African section of Disney’s Animal Kingdom. As luck would have it, another great attraction is it's next door neighbor: Kilimanjaro Safari! Kilimanjaro Safari is Animal Kingdom’s signature attraction. It takes you on a jeep safari into the heart of Africa. Along the way you will have the unique opportunity to view countless animals roaming freely in their natural habitat. 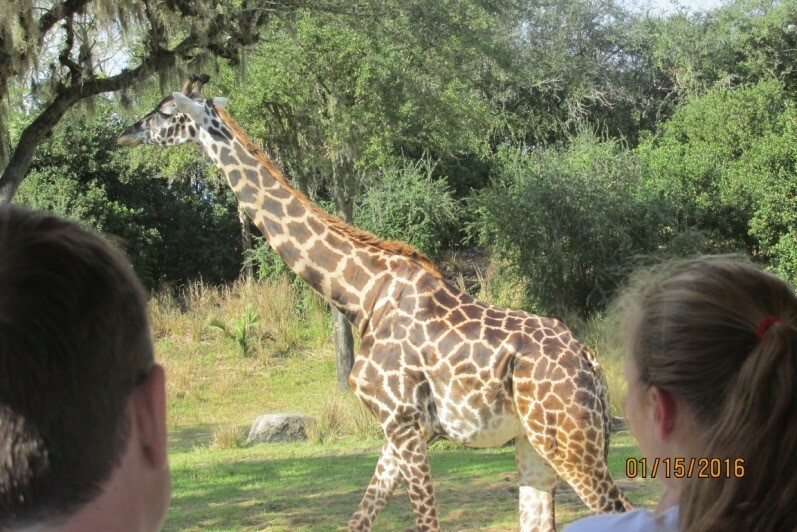 As you bounce and jostle down the muddy trail with your very knowledgeable tour guide, you can see rhino, elephants, and my favorite, the giraffe. Lions, real life versions of Simba, hang out, just chilling in the early morning sun. (Hint: Be on the lookout for Hidden Mickeys!) Flamingos add a splash of color to your day. I’ve taken this trip many, many times. Each one is unique. I am always transfixed by the majestic beasts that share our world. Going early in the day means those magnificent creatures are likely to be pretty active. It is cooler and many of them have just finished or may be still enjoying their own versions of Mickey Waffles! I am not the only one that loves this glimpse into the wild. Kilimanjaro Safari is a favorite, must-see attraction for almost everyone that visits. It often has longer wait times, and fastpasses also get filled quickly. Eating at Tusker House before opening gives the advantage of being able to get to Kilimanjaro Safari right at park opening. Lucky you! You can now be one of the first guests in line for this exciting journey thru Africa. Yay! Being able to get on quickly means no wasting time standing in line. This frees up more time for you to visit other attractions, do a little shopping, or explore the trails filled with other animal friends and plant species. And, besides that, there is no need to use a fastpass on Kilimanjaro so you can use it on other coveted experiences. Double score! 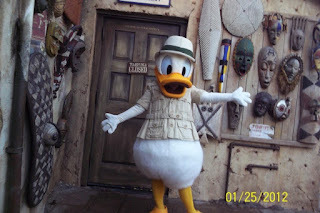 Since Tusker house is a dining experience I suppose I'd better mention the food! 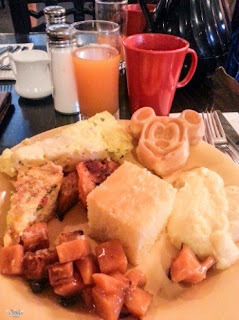 Let me just say that Tusker House offers some of the most delicious fare in the “World” for breakfast. The food is served buffet-style and is all you can eat (which is a huge plus when travelling with two hollow-legged teenage boys!) The variety of what is offered will blow you away. Even the most picky of eaters will find something they love here. I find this to be a special blessing since I am constantly trying to find something to appease the diverse appetites in my hungry crew. Traditional breakfast fare like eggs, bacon, sausage, breakfast potatoes, and gravy are served, along with other carved meats. Lots of fresh fruit, cereals and different types of yogurts are available. Tusker House has a delectable bakery section that has different breads, muffins, croissants, and doughnuts. Yes, I said DOUGHNUTS!! YUM! For more adventurous eaters, and in keeping with the African theme of the restaurant, there are several native dishes to sample. Mealy pap, a type of porridge, and beef bobotie, a minced meat dish served with a egg topping, are some of the native fare to sample. 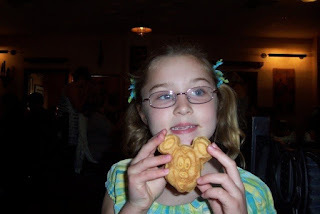 And of course, Mickey Waffles! My favorite is the fresh frittatas. Even though there are different kinds just waiting to be devoured, I always load up on the ham and cheese version. I would love to take a bite of that hot, cheesy goodness right now! Everything is always hot, fresh, and delicious. I can say without a doubt that you will not leave Tusker House hungry. In fact, stuffed to the gills is a better description. Disney always goes out of the way to make sure the food being served at their restaurants is above standard. 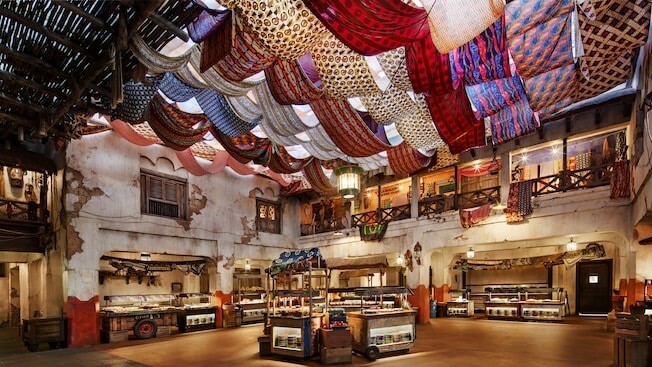 Tusker house goes beyond Disney expectations. It is fabulous! I have talked about the food and how amazing it is but there is another little offering that steals the show. 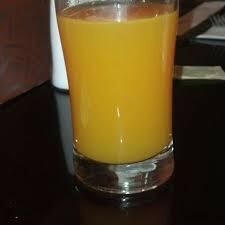 Tusker House serves a tangy, sweet breakfast drink known as Jungle Juice. It is a non-alcoholic blend of passion fruit, guava, and orange juices that you just have to try in order to appreciate. I am not much of a juice drinker (I NEED caffeine!) but I cannot get enough of this stuff. I slurp down gallons of it while enjoying my breakfast. My kids simply adore it. My eldest son, a college freshman, described it in terms like ‘ambrosia” and “micturating jungle princesses”...well you literary junkies get the point. It is good. Very good. In fact, it’s out of this world! It is tangy but refreshing. It is a little like drinking liquid sunshine!! I have tried to find something similar to it in grocery stores back home in the real world, but to no avail. Other fruit juices, even with similar juice blends, just don't match that special flavor of true Jungle Juice. It must be Disney magic! Disney has a way of just making things that you thought could get no better...well, better!! This happened recently with my beloved Jungle Juice. Mahindi, a popcorn cart in the same African section as Tusker house, now serves Jungle juice. Not just any Jungle Juice, either. JUNGLE JUICE SLUSH!!! Yep, that's right. You can now get that delicious, one of a kind flavor in a frozen treat!! And, (for a little extra moolah), it comes in a souvenir music cup!! The musical cup has the appearance of wood-carved animals decorating its outside. The handle is the cool part. 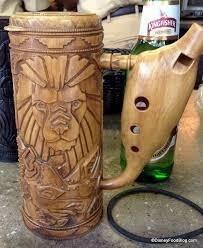 It is an ocarina, a traditional African wind instrument. The handle has small holes that produce a sound when you blow into the mouthpiece. Make up your own tunes. or follow the included directions to play things like “It’s a Small World” and other Disney favorites. Fun and refreshing all in one!! Of course, beware: It can also be used as a torture device to terrorize annoying older siblings with! For those of you that may not want to pay the $13.99 for the special cup, you can buy a throwaway cup full of frozen goodness for just $3.99. It also counts as a snack on the Disney Dining plan if you forego the souvenir cup. This new treat is edging out Dole whips and/or Mickey ice cream bars as my favorite snack at Disney World! Yummo! Either as a breakfast beverage or as a frozen treat, Jungle juice is definitely worth a try! 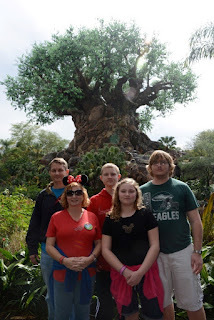 There are many reasons that my family and I love Tusker House and make it a written-in-stone, must-do on every trip. It is definitely a highlight. We started this tradition by chance many years ago when just looking for a place that served breakfast. Our accidental discovery has led to countless stories, tons of laughter, new food favorites, and of course, untold precious memories! I’m smiling as I am typing this just thinking about those priceless moments sitting around a carved, wooden table, sipping jungle juice, and just loving the time together. That’s Disney. And that’s Tusker House! Price: $15 to $59 per adult depending on the meal (breakfast, lunch, or dinner) and the season.